Do you love the festive look of a decorative pumpkin? Carving pumpkins is a beloved tradition, and it’s a great opportunity to express yourself and even undertake a creative challenge. Some pumpkin carvers love the carefully detailed process of carving (and the added bonus of scooping out and roasting the seeds.) If you’re looking for a change of pace, we have a few alternative pumpkin decorating ideas you can try out for your Halloween pumpkin ideas and all autumn long. If you’re decorating pumpkins with kids, this is a fun activity that encourages creativity and resourcefulness, and also avoids the use of hazardous carving tools. The charm of the “Junk Drawer” pumpkin is creating a fun character out of common objects you already have lying around the house. If you have a junk drawer full of odds and ends, dump it out and see what inspires you. Loose buttons, pins, stickers, string, and hardware can turn into a pumpkin’s eyes, smile, noise, hair, etc. If you’re doing this with kids, make sure to comb over the junk pile and remove anything that may be pointy or dangerous. 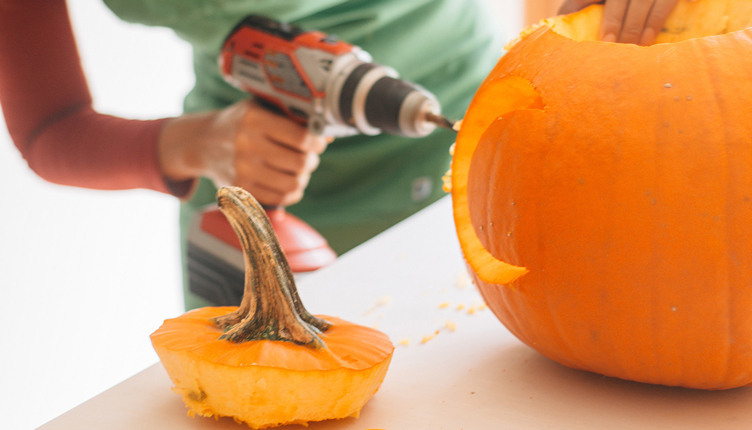 A hot glue gun is very helpful for sticking items to the pumpkin (make sure to supervise kids while using the glue gun.) If you don’t have a junk drawer, visit Rocky’s and pick up some loose bits of hardware for this project. For the pumpkin-loving Picasso, get your paintbrushes and get ready to create your next masterpiece. Painting a pumpkin is a great way to make a seasonal decoration without having to cut into your pumpkin. Use a variety of seasonal colors to complement your autumnal decorating theme – or – go for wild, zany colors if you’re aiming for a bold, fun pumpkin. Paintbrushes are good for detailed work, and if you want to cover a lot of space at once, spray paint is very convenient. You can also use thumb tacks and push pins for some added variety of texture and color. For inspiration, try and recreate some of your favorite characters from cartoons or comic strips. Or, just let your imagination run wild. If you’re more comfortable with a power drill than a paintbrush, this idea is for you. Instead of carving intricate shapes with a knife or saw, use a variety of drill bits to create a dot work masterpiece. You can achieve impressive patterns, as well as shapes and shading effects. To illuminate your pumpkin, you can use traditional candles, or for a modern twist use glow sticks in a variety of colors. You can also wire some LEDs for a bright, steady glow that won’t burn out or fade over time. Get your drill, bits, and light-up accessories at Rocky’s. No matter how you like to express yourself, Rocky’s has everything you need to get creative. Start your pumpkin decorating projects now, and you’ll enjoy your masterpiece on Halloween and all autumn long. Visit us today. 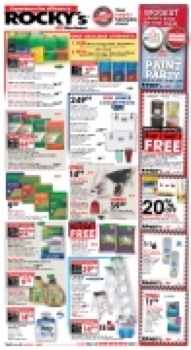 © 2019 Rocky’s Ace Hardware. All Rights Reserved.